Brownwood is served by U.S. highways - US 67, US 84, US 183, and US 377. 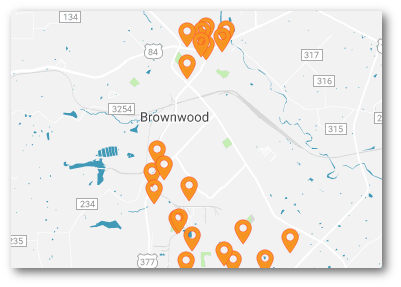 Brownwood is less than 50 miles from I-20 and approximately 100 miles from I-10 & 1-35. For more maps, visit our Location page. Brownwood is serviced by the BNSF Railroad, Texas Rock Crusher Railway, and the Fort Worth & Western (FWWR). Visit their website for information on becoming a customer. Texas Rock Crusher Railway (TXR) serves the rail transport, storage and operations needs of companies in the Pecan Valley, which lies in the central heartland of Texas. TXR operates more than 13 miles of owned and customer-leased track in their Brownwood, TX location. TXR interchanges with the Burlington Northern Santa Fe Railroad (BNSF) and serves the Camp Bowie Industrial Area, a 100-acre facility that houses the city’s major manufacturers and service providers. Visit their website for information on becoming a customer. FWWR operates over 276 miles (444 km) of rail lines, primarily a main line from Carrolton, Texas, to San Angelo Junction, Texas over both leased and owned lines and trackage rights, as well as various short lines in and around the Fort Worth area. Visit their website for more information. Brownwood Regional Airport is located on U.S. 183, five miles north of Brownwood. It lies at an elevation of 1,387 feet and covers 1,400 acres. The main runway is 5,600 feet long by 100 feet wide, with VOR/DME/LOC approaches. The airport has two large commercial hangers, three "T" hangars, a patio-type hangar, a FedEX facility and terminal. The terminal offers airport office services with pilots’ lounge, restroom, snack area, and conference room. The airport is open weekdays from 7:00 am -8:00 pm and weekends from 7:00 am - 5:00 pm. After hours, Jet A service available upon request and 100LL is available 24 hours/self-served. There are 1,150 acres of development space available surrounding the air operation area. The U.S. Government deeded the airport to the City of Brownwood after World War II. During the war, the U.S. Air Force used the airport for training and troop and materials transport. There is a static display of an F-4 Phantom and an F-111 jet on the airport grounds. The airport continues to serve the U.S. military. The 21st Calvary Brigade of the III Corp, U.S. Army, utilizes the airport as part of their flight training area for the Apache and Blackhawk helicopters.